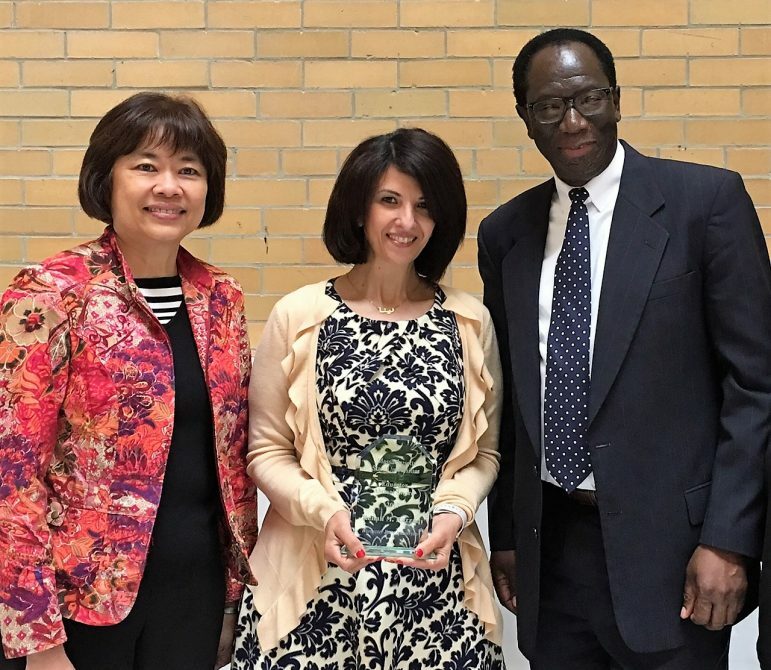 Renah M. Razzaq, a mathematics teacher at Doherty Memorial High School, represented Worcester State University at the State University Educator Alumni Recognition Award Ceremony yesterday at the State House in Boston. Worcester State University Education professor Sue Foo, left, and associate dean of Education Raynold Lewis, right, with Doherty High teacher and WSU alum Renah Razzaq. 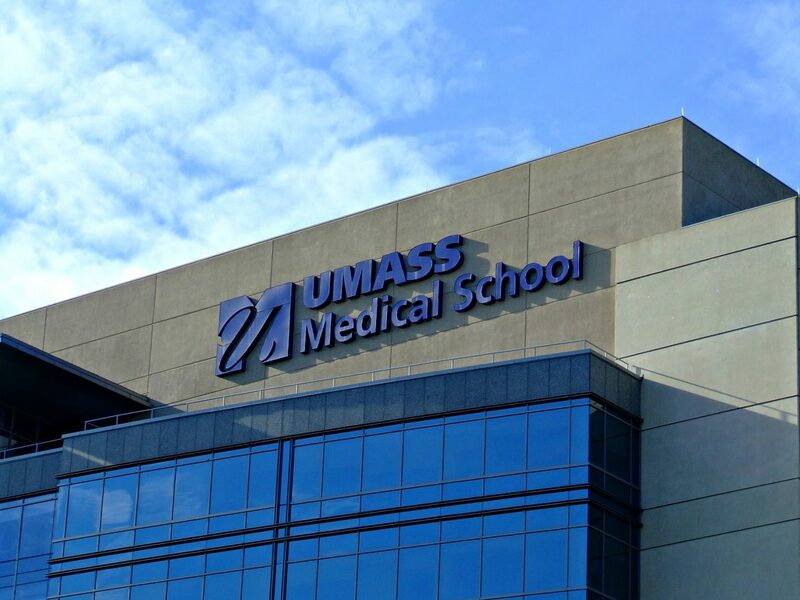 Educators representing the nine campuses across the State Universities of Massachusetts were recognized for teaching excellence. Among the educators honored were school principals, teacher mentors and team leaders, a developer of professional development programs, and a teacher helping inner-city students gain exposure to the arts. Razzaq is in her 15th year as a teacher at Doherty. She has served as department head for the last six years. She was born in the United States to immigrant parents from Palestine. She obtained her GED then completed studies at Quinsigamond Community College. She transferred to Worcester State University (then Worcester State College), from which she graduated in 2002 with a bachelor’s degree in Mathematics and in 2009 with a master’s degree in Secondary Administration and Leadership. 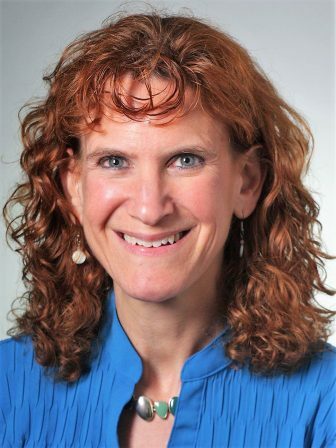 She is also an adjunct professor in the Mathematics Department at Worcester State and is enrolled in the Learning Science & Technology Ph.D. program at WPI. This case study creatively introduces the human microbiome (the genes of the microbiota that live on and in humans) from the perspective of one of its microbial occupants. Gow teaches a variety of courses in the Natural Sciences for the School of Fire and Health Science and has published case studies for science teaching as well as articles on case-based teaching and other engaging pedagogical strategies. Steven B. Bird, M.D., professor of emergency medicine, has been elected to the Society of Academic Emergency Medicine Board of Directors and will serve as its president-elect for a one-year term. Dr. Bird, vice chairman for education in the Department of Emergency Medicine and the emergency medicine residency director, has been actively involved with the society since 1998, most recently as secretary-treasurer. As president, Bird intends to focus on resident and faculty well-being. Local grant boosts Planned Parenthood’s efforts in Central Mass. The Fallon/OrNda Community Health Fund of the Greater Worcester Community Foundation has awarded Planned Parenthood League of Massachusetts (PPLM) a $12,500 grant to support the work it’s doing to encourage young people to learn about their sexual health and empower parents to become their children’s go-to resource. The city of Worcester will hold a groundbreaking ceremony for the new Blackstone Gateway Park in Worcester. The groundbreaking is scheduled for 3 p.m. Thursday, June 1. Speakers will include U.S. Rep. James McGovern, State Sen. Michael O. Moore, Rep. Daniel Donahue, Mayor Joseph M. Petty, District 3 City Councilor George Russell and City Manager Edward M. Augustus Jr.
Once complete, the park will feature approximately a half mile of accessible walking paths, elevated boardwalks and three bridges crossing a section of the Middle River that runs into the headwaters of the Blackstone River, adjacent to McKeon Road. Included along the trails and boardwalks are observational platforms, kiosks, and interpretive signage providing historical and ecological information about the Blackstone River and the role it played in the history of Worcester and the Blackstone Valley Corridor. Construction time is expected to be about 12 months.